A. CRM is an acronym for "Customer Relationship Management," while "gx" stands for "global exchange." CRM-gx is the world's first and only multilingual, multi-currency, multi-timezone, completely Web-based total business management solution. It excels at bringing together far-flung work forces, thus allowing your organization to function as an integrated whole. A. Volumes have been written about what Customer Relationship Management means and how it is used. CRM is process of recording, storing, analyzing and using customers information to increase loyalty, sales and profitability. The objective is to collect and then use information about your customers to offer the right product or service to the right customer at the right time, increasing profitability and customer satisfaction. Q. How do I get access to CRM-gx? A. CRM-gx can be accessed from the Internet, so there's no need to install software or buy hardware. The only requirement is that you have a Windows-based PC with Microsoft Internet Explorer version 5.0 or higher. To get started, simply signup and then login using the information we supply. Q. Why use CRM-gx instead of ACT or a Contact Manager like Microsoft Outlook? A. Contact management is just one piece of the puzzle. CRM-gx offers the ability to track and manage contacts, appointments, group calendars, tasks, orders, customer support, marketing campaigns, leads, deal pipelines, reporting and analytics, email, inventory, invoicing, and more. CRM-gx can manage your business, not just your contacts. Q. You say CRM-gx is fast and easy. Can you give me an example? A. One example is our "Keyboardless" data entry technology. Recognizing that busy people often refuse to do data entry, CRM-gx enables many tasks to be done with just a few mouse clicks. In benchmarked tests, CRM-gx has proven up to 500% faster than other CRM systems. This means you spend less time entering data and more time focusing on your core business. For more information, please view the series of online videos here. Show me. Q. What is the advantage of a web-based CRM system like CRM-gx over a client-based system (where you install software on your PC) ? A. CRM-gx can be accessed from any Web browser, which means there is no software to purchase, install, upgrade or maintain. With a client-based system, every time you want to add a new user, you must install a new copy of the software on a PC somewhere in the world. For both large and small organizations, this process is costly and a burden on your IT staff. It also means another application to maintain, upgrade, and configure. With CRM-gx, adding another user anywhere in the world means issuing a login and password. You can also access CRM-gx from any PC in the world, as long as you have Microsoft IE and a connection to the Web. Q. What other advantages does CRM-gx's web-based architecture offer? A. Since there is no software to install, the entire system can be deployed almost instantly across your organization. There's no need to buy hardware, software, servers, database licenses, or waste precious IT resources. CRM-gx's web-based solution also means that your organization stays connected around the world at local Internet connection rates, which is far less expensive than installing the dedicated lines, frame-relay, or VPN connections required by client-based systems. Q.Since CRM-gx runs over the Internet, won't it be slow? Q. We need to reduce our IT costs, not spend more money. How can I justify spending money on CRM-gx? A. CRM-gx allows you to cut your IT costs by eliminating the need for the hardware, software, and IT support staff currently occupied with managing your customer data. Based on our client experience, a typical midsize firm with 10 offices can save up to $760,000 per year by implementing CRM-gx. Even small businesses find they reduce their overall IT expenditures by implementing CRM-gx. More importantly, after using CRM-gx for only a week, many clients experience improved sales performance, increase customer loyalty and lower customer service costs. HydraNet offers a free one month trial of CRM-gx so you can experience its benefits risk free. Q. In the past, my staff has refused to use CRM and our implementations have failed. Why will CRM-gx be any different? A. Users often resist entering data into a CRM system and, consequently, the implementation fails. CRM-gx, by contrast, eliminates the heavy burden of data entry. Many tasks can be completed with just a few mouse clicks. In fact, you can log everything you did on an average business day in less than 5 minutes. When users try the system and see that it really is a 5 minute-a-day investment, they are often sold on CRM-gx, without the need for strong management pressure. Q. Every CRM system we've reviewed claims their system is Web-enabled, Web-based, or Web-driven. What's the difference and should I care? A. Web-enabled means the product was designed to work in another environment, but was adapted to run on the Web. Web-enabled products perform poorly when accessed over the Web. In addition, these products cannot be operated with just an Internet connection and a browser. They require software, which means you're still burdened with software installation, maintenance, and upgrades. Many companies claim their products are Internet-based or Web-based when, in fact, they are merely Web-enabled. There is a very significant difference and it's important to clarify this. To find out, ask if the product can be run using just a browser and an Internet connection. If not, you know you are going to have the same IT management issues and the burden of installed software. CRM-gx requires only a browser and an Internet connection to operate, eliminating software management and reducing IT costs. Q. We are a small-to-midsize company, not a Fortune 500 company. Is CRM-gx a product we should consider? A. CRM-gx was designed to bring the functionality and power of corporate CRM packages to small and mid-sized businesses. While some functionality is targeted at large enterprise use, we strongly recommend the system to small and mid-sized firms. We give you the flexibility to start small and scale as your company grows. Q. What is unique about CRM-gx? A. While CRM-gx has many unique and powerful features, our key selling point is CRM-gx requires just 5 minutes a day of your time to deliver powerful business results. CRM-gx is exceptionally fast, easy-to-use and tasks have been automated. View online videos showing CRM-gx in action and see for yourself how easy the system is to use. Show me. Q. I'm looking for more than a 5-minute solution. I need a system I can use everyday to help manage my business. Q. We have trouble keeping our customer account data updated and clean. We also can't track our activities by client. How can CRM-gx help? A. The core of CRM-gx is a highly sophisticated Account Management system. Every transaction, email, phone call, fax, document, visit, essentially any contact between you and your clients is stored and tracked in the CAL (Client Activity Log). One click on the History button next to an account or client name and you can see the entire history of transactions and activities with any individual or account. Q. We've got record duplication problems in our current database. How can CRM-gx help? A. CRM-gx automatically checks for potential duplicate records based on name, zip code, and telephone matches as you enter new records. The system catches potential duplicates before they're entered. Q. I need CRM for reporting and forecasting. What can CRM-gx do in these areas? A. CRM-gx has the most powerful, easy-to-use business reporting and analytics systems available. You can analyze your business by geographical region, business unit, product, product line, or even by employee. Select a date range, the criteria you wish to analyze, the format for the report, and click a button. HydraNet delivers the results in seconds. There are over 280 preset reports that quickly produce the forecasts and charts you need to make the right management decisions. Q. Can I allow my suppliers or clients to use CRM-gx? A. Limited access can be given so your suppliers and clients can see invoices, completed payments, as well as a list of your products and services. Q. Can I use our own company logo on the invoices and purchase orders? A.You can upload a logo for invoices and purchase orders. The maximum logo size is 600x85 pixels in gif or jpeg format. Q. We need to develop effective cross-selling, upselling, and one-to-one marketing strategies. What can CRM-gx do in this area? A. CRM-gx is the only web-based CRM system to include enterprise-ready marketing tools. For the first time, your team has the tools it needs to improve your marketing effectiveness significantly. CRM-gx gives you instant access to client-groups you want to target, based on the criteria you set. Sell the right product or service to the right consumer at the right time. CRM-gx delivers on the promise of one-to-one marketing without the hassle. For more information on our cross-selling and upselling systems, setup a Trial CRM-gx account and view the video help for these marketing tools. Q. What does CRM-gx have in terms of collaboration tools? A. CRM-gx enables a whole new range of collaboration and sharing across your organization. Around your office or around the globe, share any document or file, including calendars, tasks, deals, reports, leads, and client data.Then, go beyond sharing data and share your thoughts using the Integrated Enterprise Messaging system. It keeps your team communicating in real-time anywhere you have an Internet connection. Q. We're concerned about data security, both in terms of transmitting our corporate data over the Internet and having our data hosted offsite. What can you tell us to allay our concerns? A. HydraNet has achieved a 99.9% scheduled uptime level since beginning service in 2001. Our systems utilize advanced RAID and mirroring technologies and are highly redundant and fault tolerant. Already, hundreds of clients around the world trust their data to HydraNet CRM-gx. At the same time, to ensure your peace of mind, HydraNet can provide a complete weekly download of all your company data. Additionally, we offer available 128-bit Secure Socket Layer connections between you and the server, which ensures that all the data transmitted remains strictly private. SSL encyption is the same type of technology used by e-commerce websites to protect credit card security during online e-commerce transactions and is considered highly secure. Q. How scalable is CRM-gx? A. The system can serve up to 100,000 users at a single client, and is currently in use by multinationals with many offices around the world. The limits on scalability are limited only by the server hardware, memory, and bandwidth. Current maximum size for a single table in the CRM-gx database is 16TB (terabytes). Since the data is distributed in multiple tables, the maximum database size is a multiple of that. Q. Is my data and data transfer secure on your servers? A. HydraNet offers an available SSL (Secure Socket Layer) connection, which means that all data traffic between you and the server is encrypted at 128-bit resolution. HydraNet takes great care to ensure the safety of your data. Our datacenter uses fault-tolerant RAID, mirroring and offsite backups, and we deliver full weekly backups for clients who require this extra level of insurance. Q. We'd like to integrate CRM-gx into our legacy systems, including ERP and SCM. Is this possible? A. CRM-gx is typically a hosted solution but it can be run locally at your site and integrated into your legacy systems. Contact your HydraNet consultant for more information. Q. Can CRM-gx be integrated into our existing legacy systems? A. HydraNet clients frequently ask us to integrate CRM-gx into their backoffice and frontoffice systems. These include various Accounting, ERP, SCM, Order Taking, and Inventory Management systems. In the event that you need CRM-gx integrated into your legacy systems, you may also opt to have a local CRM-gx server installed at your site. For more information on these services, contact us here. Q. Can I synchronize CRM-gx with my Palm, Windows CE, Laptop, or Cell Phone? A. CRM-gx can be synchronized with any device or platform that can synchronize with Microsoft Outlook. You first synchronize between CRM-gx and Outlook, and then synchronize your device with Outlook. 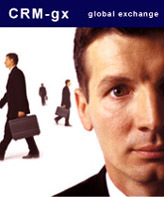 CRM-gx is also the world's first and only company to offer CRM services via your Cell Phone. This is available to users in the U.S via the AT&T Wireless mMode service, and in Japan via the Docomo i-mode and J-Phone J-Sky Services. This mobile interface allows you to access the key tools of CRM-gx from your cell phone. Browse and update customer information, appointments, tasks, deals, products, and inventory from anywhere within the service area. There is no additional charge for accessing your account via your Cell Phone, and is included as part of the CRM-gx service. Q. Can I export data from CRM-gx? A. CRM-gx can quickly export your data based on the data fields and criteria you set. Data is exported in standard CSV (Comma Separated Values) format for easy use in other applications or for analysis in Microsoft Excel. In the case of Contacts, Appointments, Tasks, and Address book records, you can export from CRM-gx to Microsoft Outlook with just a few mouse clicks. This insures that CRM-gx fits seamlessly into your organization's current business environment. Q. Who is authorized to import and export data? A. By default, anyone in your organization can import and export data using CRM-gx. If you need to limit this capability, please contact your consultant here. Q. What types of data can CRM-gx import? A. CRM-gx can import directly from Microsoft Outlook, or it can import data saved in a CSV (Comma Separated Values) format. Many programs, including Palm, Microsoft Excel, and Microsoft Access can create CSV data files. Q. What kinds of data can be imported into CRM-gx? A. CRM-gx can import tasks, contacts, appointments, Windows Address Book data, and email from Microsoft Outlook with just a few mouse clicks. In the case of importing CSV (Comma Separated Values) data, you can import contacts, company, and product data. Importing your historical ordering and transaction information can be done but this will depend on what type of data your current system uses. In the event that you need to import other legacy data into CRM-gx please contact your HydraNet consultant here. Q. How can I import my existing data into CRM-gx? A. You can easily import your client data into CRM-gx. If your client data is currently in a database or application, you can export that data into Microsoft Excel and then save it as a CSV (Comma Separated Value) file. CRM-gx can then import this CSV file quickly and easily. If you have custom database fields, these can also be quickly setup in CRM-gx. When you import your data, you can define exactly how your data is organized and which fields you store. If your data resides in Microsoft Outlook, CRM-gx can import directly from Outlook with just a few mouse clicks. Q. Can HydraNet help me import my data? A. Yes, HydraNet offers various consulting, support, and implementation options. Please contact your HydraNet consultant here. Q. How long does it take to learn the system? A. CRM-gx is easy to use and understand. Most clients are comfortable with the system in less than an hour. They can perform sophisticated functions after just a few hours. There is a text based help system and an online video help system to provide instant training to flatten the learning curve. Q. Is additional training available? A. HydraNet can provide both remote and onsite training for your company. Contact your HydraNet consultant here. Q. Do I need my IT manager's help to use CRM-gx? A. Generally not. CRM-gx has wizards which help configure the system for you automatically. It's also very easy to import your existing client data into the system. For companies that plan to use the system at multiple locations, a HydraNet consultant an help you. HydraNet offers various implementation and assistance plans. Contact your HydraNet consultant here. Q. What are the system requirements for CRM-gx? A. A PC running Microsoft Windows and Internet Explorer version 5.0 or higher. Q. Why don't you support Macintosh? A. Microsoft Internet Explorer for Macintosh does not support many of the technologies used by CRM-gx. In the future we may develop a Macintosh-friendly version of the system depending on the demand from our users. Q. Why can't I use Netscape Navigator or another non-IE browser? A. CRM-gx uses some HTML tags and tools which are not supported on non-IE browsers. In order to deliver the best possible user experience, we have decided to standardize CRM-gx to run on IE only. Q. How can I get Customer Support? A. When you sign up for CRM-gx, you select the service plan best suited to your company and budget. For more information on our support options, please contact your HydraNet consultant here. Q. Do I need to pay for software updates and upgrades? A. No. CRM-gx is constantly being improved and new features are added, but there is no charge for these updates. Q. Our salesforce is spends much of its time on the road. How do you support a mobile workforce? A. If your salespeople carry a laptop, they can work offline in MS Outlook and synchronize with CRM-gx when they have access to the Internet CRM-gx synchronizes with Outlook Tasks, Calendar, Contacts, Email, as well as the Windows Address Book. If you prefer to use your Palm, Windows CE, Blackberry, or any other Outlook-sync compatible device, that will also allow you to exchange data with CRM-gx. CRM-gx is also the world's first and only company to offer CRM services via your Cell Phone. This is available to users in the U.S via the AT&T Wireless mMode service, and in Japan via the Docomo i-mode and J-Phone J-Sky Services. These cutting edge technologies allow you to access virtually all the key tools of CRM-gx from your cell phone, allowing you to browse and update customer information, appointments, tasks, and deals. Learn more about the AT&T Wireless mMode service here. Q. We're using Microsoft Outlook. I don't want to have to enter data twice. Also, what about my PDA and cellular phone? A. Many businesses today use Outlook and Microsoft Exchange to handle calendars, contacts, email and tasks. CRM-gx synchronizes with Outlook so that any data you enter into either system can be quickly exported into the other. Palm, Windows CE, and virtually any other Outlook-compatible device can also synchronize with CRM-gx with just a few mouse clicks. CRM-gx is also the world's first and only company to offer CRM services via your Cell Phone. This is available to users in the U.S via the AT&T Wireless mMode service, and in Japan via the Docomo i-mode and J-Phone J-Sky Services. These cutting edge technologies allow you to access the key tools of CRM-gx from your cell phone. These gateways give you the ability to browse and update customer information, appointments, tasks, and deals. The PDA and Cell Phone are replacing laptops as the primary information management tool for today's mobile workforce. CRM-gx empowers your mobile devices by putting your corporate data and schedule at your fingertips, wherever you go. Q. Our company has a complex workflow process. Can your system to be customized to meet our needs? A.CRM-gx solves your workflow and pipeline tracking issues with a combination of our patent-pending 5 Star System and powerful analytics reporting. Our 5 Star System allows you to track deals throughout their lifecycle, insuring that nothing falls through the cracks. The CRM-gx 5 Star System also allows you to track, assess, and act on opportunities quickly, resulting in more deals closed. Q. What parts of CRM-gx can be customized? A. CRM-gx is highly flexible and customizable, and can be tailored to the needs of virtually any business or industry. Most importantly, customers can customize their own work environment. The Deal system allows you to customize workflow, and the database allows you to create and change fields quickly and easily. You are in control of the type of data you store, view, and analyze. Q. What is the job of the CRM-gx System Administrator? A. The Administrator is in charge of managing your CRM configuration and implementation. He will personalize the system for your company, setting time zones, default currencies, and so on. This Administrator can also add custom fields to the system, add and remove users, and set new logins and passwords. We recommend you select someone in your IT group who understands your business to assist with this role. If you don't have an IT department, anyone familiar with your business and comfortable with the Internet should have no trouble fulfilling that role. We can also manage this process for you by assigning one of our experienced professionals to act as your Administrator. Please contact your HydraNet consultant for more information. Q. How can I sign up and pay for CRM-gx? A. For accounts with fewer than 25 users, you can pay for your licenses by credit card. If you have more than 25 users you have the option of being invoiced. For more information please contact us here. Q. How are we charged for CRM-gx? A. HydraNet charges monthly for the number of licenses assigned to your account. You are billed based on the number of licenses, not on the number of active users. You may opt to pay quarterly, or annually. If you have fewer than 25 users, we require payment by credit card. If you have more than 25 users you can request invoices and pay by check, wire transfer, or bank deposit. Our payment terms are Net 30 from the date on your invoice, and your payment is due on or before the first day of service. Q. What happens if I reduce the number of licenses in the current billing period? Do I get a refund? A. The User License Agreement states that we require 30 days notice to reduce the number of licenses on your account. Q. Where should we send checks?